Llanfair Caereinion TownLlanfair Caereinion is in the heart of old Montgomeryshire's Banwy valley and is one of the smallest towns in Powys. The quaint and sleepy exterior of the town give it a picture book feel that typifies the traditional Welsh countryside. The Welshpool to Llanfair Light Railway operates from the eastern edge of town, a short walk over the Banwy Bridge from the hilly streets of the centre. 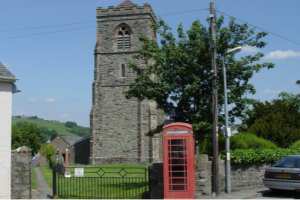 The Church of St Mary stands at the heart of Llanfair Caereinion and despite being rebuilt in 1868 still retains 15th century roof timbers, a fine south doorway and baptismal font from the early 13th century. The Church in nearby Llanllugan is also of particular interest, dating back to the 6th Century and retaining a 15th century stained glass window of true beauty. Meanwhile the Adfa Chapel is testament to the work of one of Llanfair's most famous sons, the Methodist Preacher Lewis Evans. Every year the Llanfair Caereinion Carnival proceeds through the town with a full parade of floats and dancing troupes, much to the pride of the locals. Likewise the Llanfair Show is a cherished occasion; the one day show aims to encompass all that is best in the Montgomeryshire countryside. Llanfair is also home to Welsh folk singer Sian James, Ian Gomm of Brisley Schwarz fame (who recorded several famous tracks, including 'Peaches', for the Stranglers at his studio in the town) and singer songwriter Sammy G.
Llanfair Caereinion is in the heart of old Montgomeryshire's Banwy valley and is one of the smallest towns in Powys. The quaint and sleepy exterior of the town give it a picture book feel that typifies the traditional Welsh countryside.